Good police officers are often promoted into supervisory positions with little or no training for what makes a good manager. 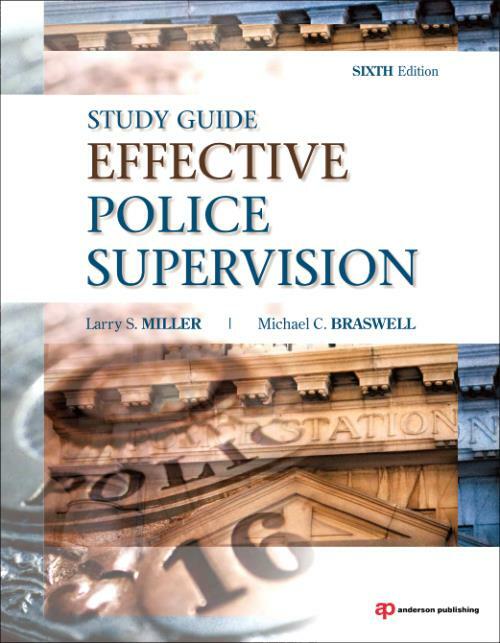 Effective Police Supervision is positioned to be the core text in college-level classes on supervisory practices in criminal justice and will provide students with an understanding of the group behaviors and organizational dynamics necessary to understand the fundamentals of police administration. This Study Guide gives students a place to test themselves and review the material so they are well prepared for their examinations. NEW THIS EDITION Following the changes to the Effective Police Supervision textbook, this Study Guide has a new title and approach for Chapter 2: Community-Oriented Policing and Problem Solving -- Improving Neighborhood Quality of Life. It has moved the discussion of training into Chapter 9 and has added a new Chapter 16, Homeland Security and Terrorism-A Changing Role. - Helps the student to grasp key concepts and synthesize the material in a meaningful and applicable way that goes beyond learning by rote. - Learning Objectives and Key Terms help the reader to focus on key material as they read the text. - Questions and answer key give the reader the opportunity to measure how well they are grasping the material. Larry S. Miller is Distinguished Professor of Criminal Justice & Criminology at East Tennessee State University. He is the author of several books on topics including criminal investigation, criminal justice report writing, police photography, and more. Dr. Michael C. Braswell is Professor Emeritus of the Department of Criminal Justice and Criminology of East Tennessee State University (ETSU). Braswell received his Bachelor of Arts in Psychology from Mercer University in 1969, a Master of Arts in Psychology from West Georgia College in 1970, his Ed.S. in Rehabilitation/Correctional Counseling from the University of Georgia in 1973, and his Doctorate in Counseling Psychology from the University of Southern Mississippi in 1975. He joined the Department of Criminal Justice and Criminology at ETSU in 1977, and teaches classes on Ethics and Justice, Human Relations and Criminal Justice, and Film Studies in Crime and Justice.